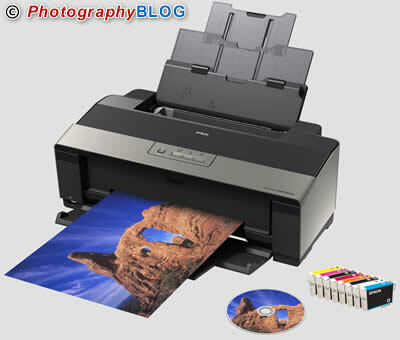 The Epson R1900 printer produces durable, superior quality, Hi-Definition photos up to A3+ on a wide range of media. The R1900 includes groundbreaking image processing algorithms and a new formulation of Epson UltraChrome Hi-Gloss Ink technology. UltraChrome Hi-Gloss2 offers a wider colour gamut, natural skin tones and consistent colour with a smooth gloss finish. The Epson R1900 prints onto glossy, matte and fine art paper in cut-sheet and roll format and directly onto printable CD’s and DVD’s. The Epson R1900 will cost £399.99, available November 2007. The Epson R1900 will be available in the first quarter of 2008 in the US for $549.99. Incorporating revolutionary colour processing technology and UltraChrome™Hi-Gloss2 Ink, the Epson Stylus Photo R1900 offers a new level of quality for photo enthusiasts, who demand the big picture. 03 October 2007– The Epson Stylus Photo R1900 incorporates the latest developments from Epson to provide durable, superior quality, Hi-Definition photos up to A3+ on a wide range of media. It includes groundbreaking image processing algorithms to manage colour combinations and ensure beautiful prints. It also features a new formulation of Epson UltraChrome Hi-Gloss Ink technology. UltraChrome Hi-Gloss2 represents the evolution of photographic printing, offering a wider colour gamut, natural skin tones and consistent colour with a smooth gloss finish. In addition to cyan, magenta and yellow inks, UltraChrome Hi-Gloss2 features matte black, photo black, red, orange and gloss optimiser. The new orange ink replaces the blue ink previously used with UltraChrome Hi-Gloss. It allows Epson to offer significant enhancements in colour reproduction for natural skin tones. Output also features more vivid oranges and an expansion in the red colour gamut. The magenta and yellow inks have been reformulated and contribute to accurate blue and green tones. The resin coating of the gloss optimiser and colour inks has been redesigned to create even smoother and glossier prints. The individual ink cartridges mean only the colour that is used needs to be replaced. The eight-colour inkset featured in the Stylus Photo R1900 creates a staggering 18,446,774 trillion colour combinations. To calculate which combination should be used to deliver the tones and colours required for the images, Epson has developed new Look Up Table (LUT) technology in partnership with one of the world’s leading centres of colour science, the Munsell Color Science Laboratory of the Rochester Institute of Technology. In conjunction with the Micro Piezo™ print head the Epson LUT technology decides how much of each colour is used to translate a RGB source file into a print. The mathematical algorithm effectively optimises colour matching to ensure the printed image is consistent with the original photograph. The end result is prints with smooth gradations, reduced graininess, wide colour gamut and low colour inconstancy*; all of which combine to create clear and beautiful, Hi-Definition photographic images. Other printing technologies in the Stylus Photo R1900 include Epson’s Variable-sized Droplet Technology. The smallest droplet of 1.5pl is used for areas where fine detail is required and bigger droplets where larger blocks of colour are needed. The flexibility of the Stylus Photo R1900 is further enhanced with its increased media support. It will print onto glossy, matte and fine art paper in cut-sheet and roll format. It prints directly onto printable CD’s and DVD’s. For printing photos without a computer photographers can connect their digital camera or picture viewer using Pictbridge. The comprehensive software package includes Epson Print CD and Epson Creativity Suite including Epson Easy Photo Print, FileManager, Web to Page and Camera RAW Plug-in. Glass mount: 2mm, soda lime. Fade criteria: Pure YMC 30% Loss at OD=. Display-life Calculation: Total illuminance/(500 lux x 10 hours x 365 days = 1 year). The data is calculated using Epson’s accelerated test and does not mean Epson guarantees lightfastness. Tests developed and conducted by Epson. About the Munsell Color Science Laboratory (MCSL) of the Rochester Institute of Technology (RIT). The Munsell Color Company was founded by Professor Albert H. Munsell, the originator of the Munsell Color Order System. The directors of the Munsell Color Company eventually sold the company’s assets and created the Munsell Color Foundation. The Munsell Color Foundation was charged with furthering the scientific and practical advancement of colour knowledge. In 1983, the Foundation trustees voted to dissolve the foundation, and donate the proceeds to an academic institution for the creation and endowment of the Munsell Color Science Laboratory. RIT was selected as the recipient of this donation, and MCSL was born. Epson is a network of 87,626 employees in 117 companies around the world, and is proud of its ongoing contributions to the global environment and to the communities in which it is located. Led by the Japan-based Seiko Epson Corp., the Group had consolidated sales of 1416 billion yen in fiscal 2006. Epson Europe B.V., based in Amsterdam, is the Group’s regional headquarters for Europe, Middle-East, Russia and Africa. With a workforce of 2,400 employees, Epson Europe’s sales for fiscal year 2006 were 2,104 million Euros.